One of our final days’ sail was to the Tobago Cays. The Cays are a small group of five uninhabited islets belonging to St. Vincent and the Grenadines. They are a national park, and are surrounded by a horseshoe shaped reef. The most extensive coral reef complexes occur on shallow shelves around the windward sides of both Mayreau and the Cays. It’s a snorkeler’s paradise. The Tobago Cays is approachable only by sea, and is about two nautical miles from Mayreau. 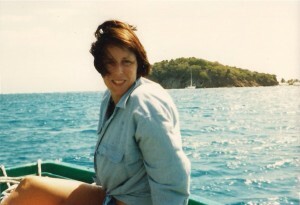 We anchored our sloop, “Old Vic”, on the west side of Tobago, and took our dinghy around to the northern beach. We pulled the dinghy up on shore and plunged into the clear, warm water. The Cays proved to be our favorite snorkeling spot. The aquamarine and blue colors are unlike anything in this world. I kicked against the strong current to head out toward the reef. In addition to the incredible variety of fish, and the occasional sea turtle, there were also sharks in the reef. You had to keep a watchful eye out. The strong current made my legs ache from my persistent flipper kicks. But I could now easily stay under water for half an hour at a time snorkeling; I had mastered the slow, measured breathing through the snorkel barrel. Live coral formations were everywhere and the fish followed. As I continued my undersea adventure, something bumped my side. I turned quickly taking in a snorkel full of salt water, thinking it might be a nurse shark. Instead it was my flirtatious friend from the night before. It was a happy surprise seeing him again. We embraced, somewhat clumsily, as the strong current pushed us around. The 51-foot sloop with the Bavarians aboard had set sail from Mayreau earlier, and unknown to us, had also planned to sail to the Cays. With so many boats and hidden moorings among the five islets, it seemed a slim chance we would meet again. Our swaying embrace in the warm turquoise waters of the Tobago Cays was a picture-perfect moment in time; the accidental romance. We laid on the warm sand afterward, languishing for a few final moments, before we separated and said our good byes. Surely this is god’s favorite place, for it has been blessed with every good thing. Karen and I did not want to leave. We decided to snorkel a while longer, and then took a few photo opportunities on the beach. We felt strong after ten days at sea. Finally, the three of us rowed our dinghy back to our 36-foot sloop, “Old Vic”, for one of our final evenings in the Caribbean. Karen and I flexing our muscles in the Cays. Karen in our dinghy as we returned to our boat.